In 1991 two English men claimed responsibility for the creation of crop circles. The huge patterns had scientists puzzled with explanations ranging from UFOs to whirlwinds. In 1991 a mystery was solved when two English men claimed responsibility for the creation of crop circles. The huge patterns had been appearing on farmland across England for years and had scientists puzzled, with explanations ranging from whirlwinds to UFOs. Despite this admission of guilt, many people still refused to accept this simple explanation. So what is the truth about crop circles? Claire Bowes has been speaking to John Lundberg who knew Doug Bower one of the men who came forward in 1991. 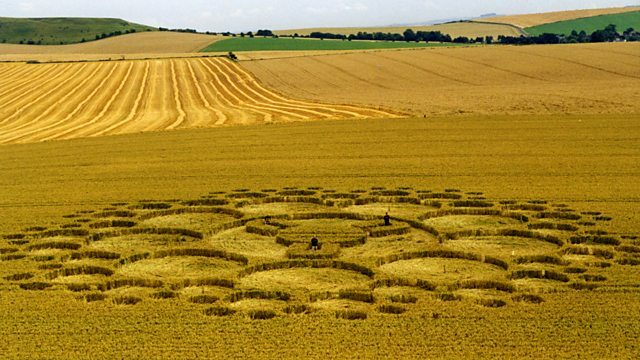 Photo: (BBC) 1999 A crop circle made for the BBC TV programme Countryfile.